The holiday spirit is alive at the U.S. Botanic Garden, where fantasy trainscapes, poinsettias and one of D.C.'s largest indoor Christmas trees are on display. WASHINGTON – The nation’s hub of plants and horticulture embraces the holiday spirit with trains, poinsettias and a giant Christmas tree. 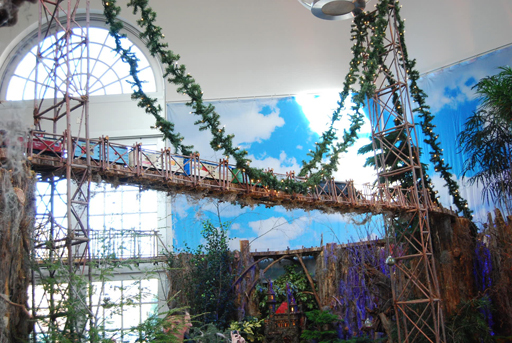 Several sections of the United States Botanic Garden have been transformed for the holiday season, most notably the East Gallery, which features a fantastical holiday trainscape. The Botanic Garden has hosted fantasy trainscapes since 2004. This year’s trainscape has been constructed primarily with pine cone scales, willow, screw pods, grapevine tendrils, acorns and acorn caps. There also is a historic replica of the National Mall, with architectural details made from all-natural plant materials. The West Gallery features one of Washington’s largest decorated indoor Christmas trees. The holiday exhibits run through Jan. 1, 2013. Admission to the conservancy, where the exhibits are located, is free. Conservancy hours are 10 a.m. to 5 p.m. daily. For more information, visit the garden’s website. poinsettias and a giant Christmas tree.